This is a sturdy bed with lots of storage if you choose the drawer option. Fairly easy assembly. We like how this bed does not require a boxspring. Dramatic and turned posts at each corner and charming paneling throughout its durable rubberwood construction make up this Ediline platform storage bed by iNSPIRE Q Classic. Each product ships in four (4) boxes. Boxes may arrive separately. It's a beauty. I intend to paint it, so I won't complain about the off-white color. If you're looking for a solid white though, you might be disappointed. It's kind of a light gray and white antique type finish. I love this bed! Looks like the picture! Well made sturdy! And delivery was quick! Highly recommend! I have wanted a poster my whole life. I am just over joyed with it! "Is the king size available in Cal king?" "When will the King Oak be back in stock? It appears it is the only color not available in king." 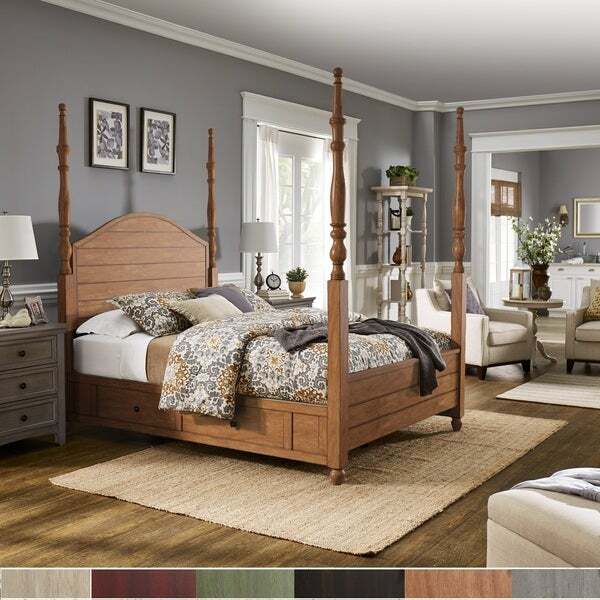 The oak finish king size option is expected to be back in stock by March 8th,2019.